Boyd Flotation foam filled waterbed tubes fit inside a 4" shallow fill softside waterbed mattress. A foam filled tube allows reduces motion while allowing you to independently adjust the level of support, from plush to firm, of each side of the bed. 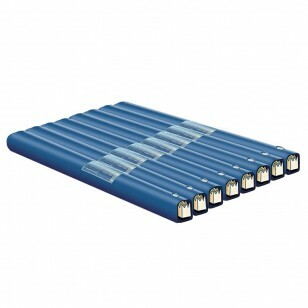 These are replacement tubes for a softside waterbed mattress. Not certain if you have a foam filled tube? Open the valve of your tube. If you see white, fiber like material inside, you have a foam filled tube. Softside waterbed replacement tubes sold as sets only. Shallow fill replacement waterbed tubes fit a 4" shallow fill softside waterbed mattress. Each foam filled waterbed tube comes with one (1) waterbed conditioner tablet already pre-placed inside each tube. We recommend that you add replacement waterbed conditioner tablets once per year.